Our Designer Metal Logos can be easily fixed to jeans-wear, shirts, shorts, cargo, bags etc. They are designed differently offering unique look to the product where it is used. There are different colors available and price ranges are genuine, matching the quality of the metal plates. The surfaces are properly polished, so that there is no possibility of sharp edges or color loss. Metal Luggage tags with Laser engraving on 1 side and Etching on 1 side. We have firm devotion in offering a top quality of Reserved Sign Table Tag, which is recognized for their high strength, reasonable price and long service life. 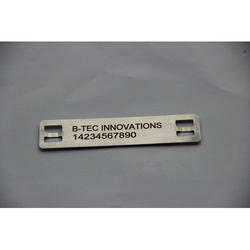 We manufacture qualitative Metal Tag for our customers. These are made with quality raw material. Manufacture various types of metal tags and ids as per brand logo as well as for general use. Assisted by a team of diligent professionals, we have been able to offer Metalic Tags. Our offered tags are made using high-grade metals that are checked on various parameters to ensure flawlessness. We manufacture all types of embossed and engraved metal tags in Alluminium in Stainless Steel fpr various purposes. These tags are manufactured in high quality metals with a clear and sturdy finish. - M-Warrior is a frequency independent tag and operates effectively with read range of over 7meter when attached to metal. - Rugged construction IP68 for high durability. - Can be attached by thread or cable tie. - Can also be provided with Adhesive tape for easy attachment. We are manufacturing Mount on Metal Tag.